Severe hemodynamic shock is characterized by poor tissue perfusion. This results in reduced organ (e.g. brain, heart, kidney, etc.) function and switch to unaerobic metabolism, acid formation and loss of arteriolar tone. When this happens the arterioles and veins dilate and blood pools in the periphery which further reduces blood pressure and cardiac output. The EED is indicated for use in severe shock of categories 1 and 2. It is not currently recommended for categories 3 and 4. In addition to the standard treatment (fluids, blood, vasoactive drugs, supportive measures), apply EED to one leg and measure blood pressure. If the systolic blood pressure continues to be pathologically low (e.g. below 80 mm Hg) , apply second EED to other leg. In patients who have uncontrolled bleeding (e.g. 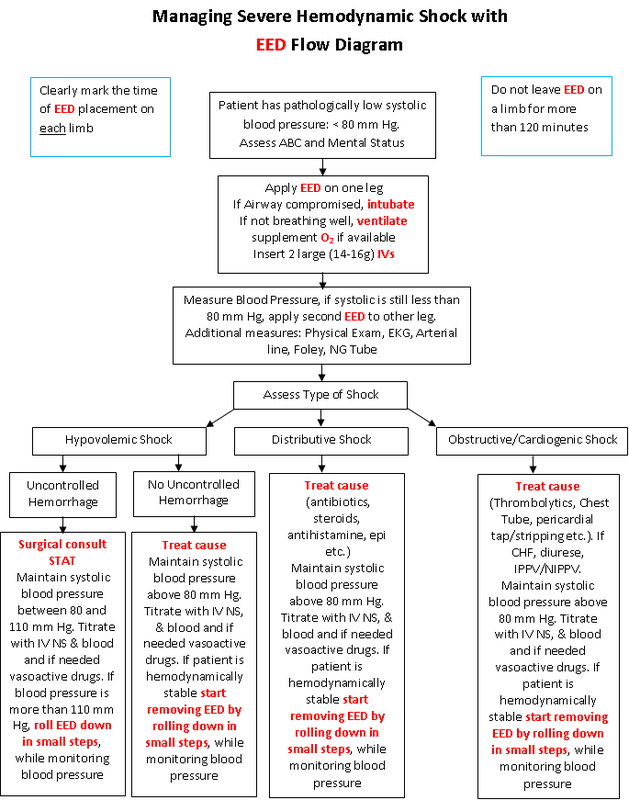 intra-abdominal hemorrhage), the systolic blood pressure should be kept between 80 to 100 mm Hg or as instructed by a physician (see Blood Pressure Titration by the EED paragraph below). In other types of shock the systolic blood pressure may be allowed to exceed 100 mm Hg. Rolling the EED up a limb increases the blood pressure. Rolling it down will reduce systolic blood pressure. Rolling is done by manually rolling the ring down the limb (picture). it should be done in small steps of about 15 cm (6") each. After each step, the blood pressure of the patient should be measured. If the blood pressure falls to less than 80 mm Hg, or other symptoms of hemodynamic instability (e.g. excessive tachycardia, cognitive deficit) are seen, consider bringing the EED back up. This should be done by pulling the straps as in the first application of the device. The EED should not be left on a limb for more than 120 minutes (two hours). In order to verify, it is important to mark the time of applying the EED on each limb very clearly using adhesive tape or stickers (see picture).